So here we are again. 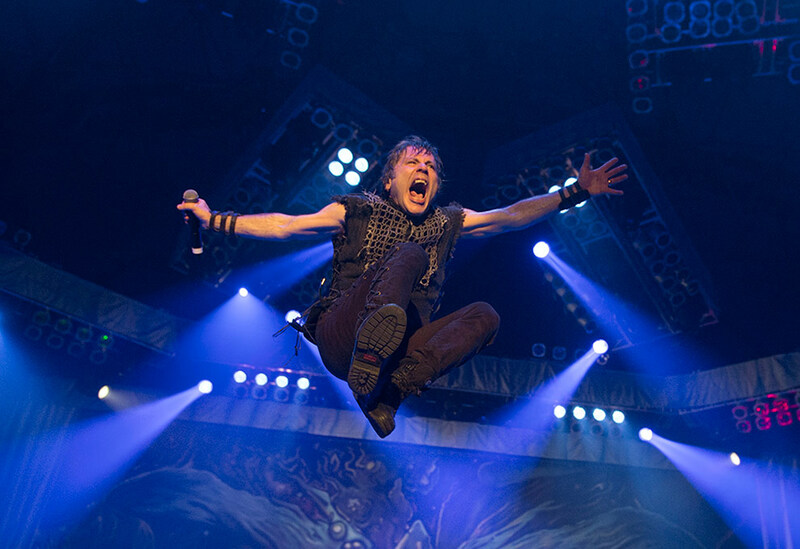 It's been five long years since we've been able to hear any new music from Iron Maiden. Considering the fact that the band has been around in some form or fashion for 40 years - and 5 all of sudden doesn't feel that long. But the fact that they HAVE been around that long and HAVE been making records for 35 years means one thing. In fact, the youngest member of the band is the Bruce Dickinson, their lead singer - clocking in at a 57 years young. I always find it funny when people say to me, "Haven't you outgrown this music?" How can I possible outgrow music that is made by men decades older than me? They obviously haven't outgrown it? Why should I? But as the years go by, and time keeps on rolling, you have to wonder how much longer can they keep doing what they do? And that is why those 5 years feel so long. Longer still after hearing in February that Bruce Dickinson was being treated for cancer. Nevermind the fact that this cancer was on his tongue and he is a vocalist. The fact that this middle-aged man had to undergo cancer treatment was very real and very scary. But the best possible news came in May, when it was announced that Bruce was cancer free! And how else would they announce it but with this picture to go along with the story? Quick note - I was lucky enough to be 4th row at a Maiden show and see Bruce flying in the air like this. Looked like he was going to fly into the first row! So with Bruce given the "all clear" with his health, the next steps were for him to get his strength back, and for the band to put the finishing touches on a new album. A little over a month later, Iron Maiden announced that their 16th album, Book of Souls, was coming out on September 4th. A week later we learned that they would be releasing the first single - Speed of Light - in August. In the past, this would mean that I would go down to Stawberries or Record Town - or a few years later to Newbury Comics - to buy the single and listen to it over and over in my car's tape deck. But before that, they probably would've debuted the new video for the new song one Saturday night on MTV's Headbangers Ball (which I would record religiously as a kid). Today? They just premiere the video on YouTube. So without further ado, I give you the newest Iron Maiden song - and video which will make video game fans very happy - Speed of Light. So I got up around 7:00am this morning and before I took my dog out - and before I went over to take my brother's dogs out (you're welcome Shaun) - pulled up YouTube on my Roku and watched the new Iron Maiden video/song on my television. As you can see, the band isn't in the video at all. That actually makes sense to me. Bruce was dealing with his health issues, and with timing I think it was probably easier to do a video like this without any cut-ins of the band performing. So first, let's talk the video. Off the bat, I thought - what am I looking at? Then in dawned on me that this video was "Eddie" - the Iron Maiden mascot - was traveling through time and stopping at various moments - in video game history! Oh did you not think Iron Maiden - 6 old, soccer loving, blokes from across the pond were video game fans? Well, I have no idea really, but that doesn't mean that video games haven't been part of Iron Maiden's history. Oh yes. I bought this double CD/CD-ROM for my PC. It was, "how you say," not good. But it was Maiden, so I had to have it. And it spawned a tour with Bruce and Adrian Smith returning to the band - which I saw back in 1999 - so the bad game was good for something. But now we see Eddie if four video games that I want to play right now! As much as I've always enjoyed seeing Iron Maiden videos, they've always come second to the music itself. The first time I watched the video, I was listening to the song - but I was also very focused on the video. Afterwards, my thought on the song was - Bruce sounds great (remember, he might have been singing this not realized he was sick) and the song definitely sounded like Maiden (which is more important than you think). But I needed to listen more. So I bought the single off of Google Music (no, not iTunes) and proceeded to listen to it. And listen in to it. And listen to it. Taking out my brother's dogs? Listen to it. Go grab lunch? Listen to it. And listen to it. And start to know it. And start to feel it. And start to sing along. I would've love them to release that song as a single! But Maiden doesn't focus on putting out a song that would make a great single. They just focus on putting out a song that will help make a great album. And at under a month to go before we get that album, I am very happy with what I've heard here today. The guitars - all three of them - sound great. I look forward to trying to teach myself most of this (I can't do those first two solos, but maybe that last one). And I look forward to learning every lyric, so that I can sing the song for years to come. Because I'm an Iron Maiden fan - and that's what we do.